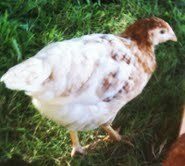 Wouldn't it be fun to have a few chickens. . .safe eggs. . .easy to care for. . .cheap to keep. . ." That's the line I used on my husband, Tom, back in early August of 2010. 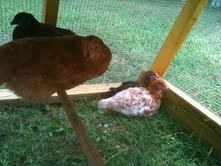 A vet had been to the house earlier that week and told me how much she loved her backyard chickens. I'd toyed with the idea prior, but never acted on it. . .more pets - right up my alley." So, Tom knew what was coming when I tossed the idea around, a well-planed monologue, delivered in an off-hand manner. . .I'm practiced at the art of persuasion, especially when it comes to critters. Like I mentioned, Tom is nobody's fool. . .this is sort of a dance we do, I think it amuses both of us in our own way. He pretended to change the subject, waiting for me to lead him back to birds, and I didn't disappoint, nor keep him waiting. I rattled off, in a very casual tone how I'd already checked with the zoning commission and animal control and so long as neighbors didn't complain about noise or smells, chickens were A-OK! I'd read a ton of info on the net, even lurked all over this forum. . .consulted a friend who's a vet. . .I had a plan! 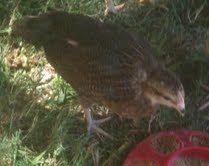 Of course, Tom relented and the moment he left for work the next morning, I was online, emailing a local hatchery, inquiring about chics. By noon, I'd drawn a picture of a tractor I wanted my brother to build for me and an hour later, I was dropping it off for him. The fence company came out and placed a fence, within my fence, to keep my 4 dogs to one section of our 1/2 acre back yard so they can't get next to the chickens. Then needed another set of steps built off our deck, so the dogs could get in and out of the house using their dog door, without going near the chickens. . .more work for my brother. . .
Then finally, 4 weeks after that first conversation, I was pulling into my driveway with 4 adorable young ladies in a box on my back seat. My tractor was great, but I had a spinal fusion in '96. . .the girls didn't want to go upstairs/inside. . .I worried about them. . .then comes the conversation, "Honey, have you seen the chicken coops at the Amish Market on Cleveland Road?" The pleasure of getting to know them, even though they haven't yet laid their first egg. . .PRICELESS! 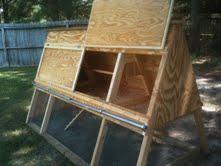 Of course, no coop would be complete without a foul weather run roof for the fowl, right? This is a nice coop but most people will not be able to reproduce what is here. 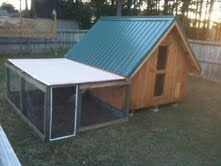 There are no dimensions, plans, process pictures nor any help for another chicken owner to follow this build.